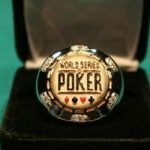 History was made on Day 4 of the 2014 World Series of Poker. This history didn’t involve the largest field in a particular poker variation, however. 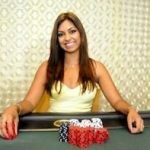 It involved women’s poker, and one woman stole the show. 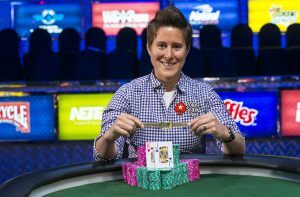 Vanessa Selbst came back from a 5-to-1 chip deficit at one point in her heads-up match against Jason Mo, and she won her third WSOP bracelet. She became the first woman to win three open event bracelets in the history of the Series, and her winner photo with her wife and two dogs was a first for the game as well. Selbst now sits with more than $10.5 million in live tournament earnings, extending her lead as the winningest woman in poker and moving into territory never before inhabited by a woman. Brandon Shack-Harris won his first WSOP bracelet yesterday as well, beating a very big field and tough final table to grab gold. 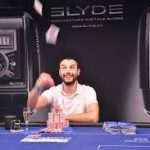 Other tournaments finished the night with big names like Phil Galfond and Kyle Cartwright with chip leads. 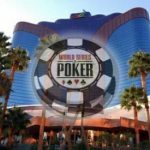 Rails around tournaments have been impressive, as has been the poker action at the Rio. Day 4 brought the final two players back for heads-up poker, with Jason Mo holding 5.86 million chips to the 3.96 million of Selbst. The two had some history together, as Mo had not been kind to Selbst on Twitter and elsewhere. Selbst also identified Mo as one of the men who played the WSOP Ladies Championship two years prior, which upset Selbst. It was not a friendly match. Mo came out of the gate strong and chipped up to hold a 5-to-1 chip advantage over Selbst at one point. But Selbst doubled and quickly got back into the game. At some point, she got Mo’s number and soared, straight into the historic winner’s circle. Steve Billirakis had a solid chip lead going into the action, with Brandon Shack-Harris in second on the leaderboard. Billirakis started strong by busting short-stacked Paddock in sixth place, but he suffered some setbacks as Shack-Harris soared. Ultimately, Billirakis exited in fourth, Iori Yogo took third, and Shack-Harris took the lead into heads-up play. After about an hour, Shack-Harris took gold. Day 2 had a long way to go, starting with 186 players. They were all in the money, though, and chip leader Alan Clunie fell and cashed out early. Players like Olivier Busquet and Andrew Lichtenberger exited throughout the day as well, and the late-night bustouts included Jamie Kerstetter and Jeff Gross. Day 2 started with 54 players and did shrink the field. Late into the night, players like Matthew Ashton and John Hennigan departed, and the money bubble took some time. In the end, it was Jason Mercier who eliminated Tom Schneider in 13th place to open the money door and end play for the night. Events 4 and 5 will play to the final table and for the win. Events 6 and 7 will try to reach their final tables. Event 8 ($1,500 NLHE Millionaire Maker) offers two flights – noon and 5pm – with reentries allowed in the latter flight.